Welcome back! 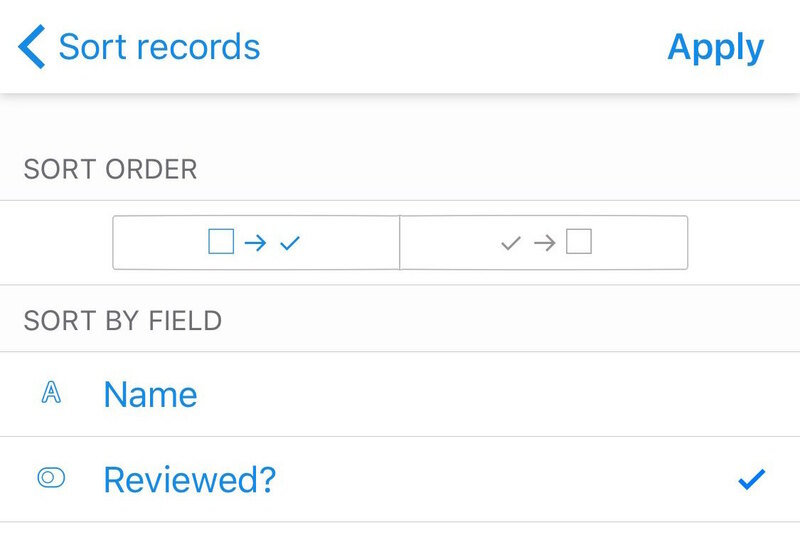 Now that you've learned about how to make records and customize fields, it's time for you to learn about the ways in which you can organize your records—by using sorting, filters, and views. Let's return to our mascot recruitment example, and assume that you've added a few more fields to your Applicants table—like an email-type field to store your applicants' emails, a phone number-type field to store their phone numbers, or a single select field to track what stage of the interview process each applicant is in. In a base, you can create multiple views for each table. Each view is like a different lens through which you can “view” the same underlying table data. This can be extremely useful when you only want to see records fitting certain criteria, or when you have a lot of records and scrolling through all of them gets a bit unwieldy. Let's make a view for our table which will only show us the applicants who have reached the "Decision needed" stage in the interview process. To start, tap the dropdown arrow to the right of "Main View" in the view bar. This will show you all of the available views, and the "+ Create a new view" dialog. By default, the only view in the table is "Main View." Tap "+ Create a new view" when you're ready. You will then be prompted to give your view a unique name. Let's go with "Needs decision." (Boring, but descriptive.) Then, we'll need to add the appropriate filter for this view. Tap the "Add filter" button under "Show records where." This will bring up the "Create View" menu. Currently, the filter field is set to "Name," the filter operator is set to "contains," and the comparison value has not yet been defined. Let's tweak these settings so that we will only be able to see records that have "Decision needed" selected in the single select "Stage" field. 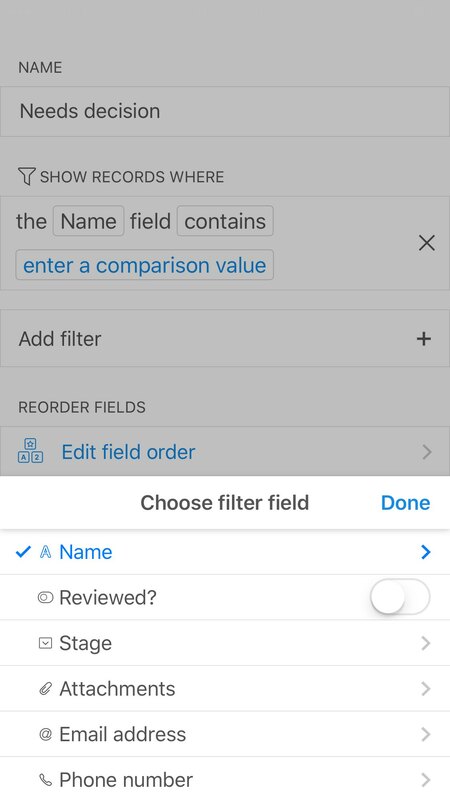 If you tap the filter field button (which is currently set to "Names"), it will bring up all of the different fields for the Applicants table. 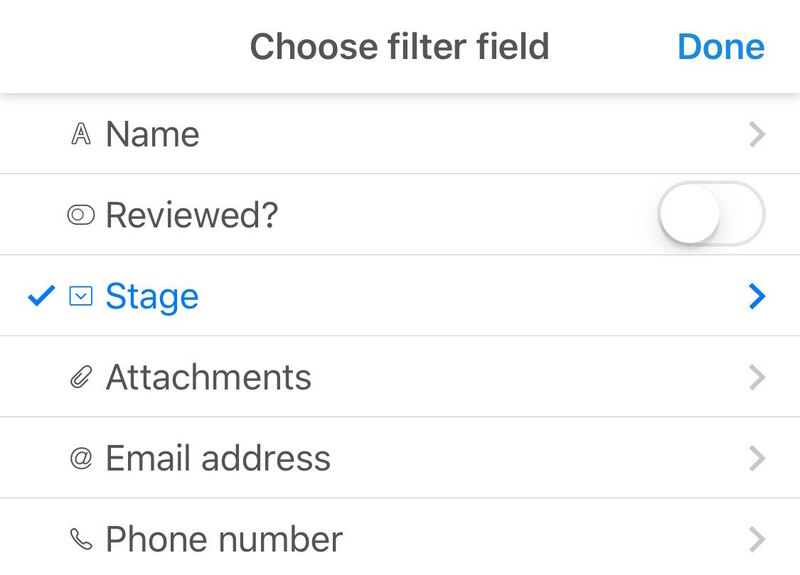 Scroll down, then tap the "Stage" option to set the filter field to Stage. You will then automatically be prompted to set the filter operator. 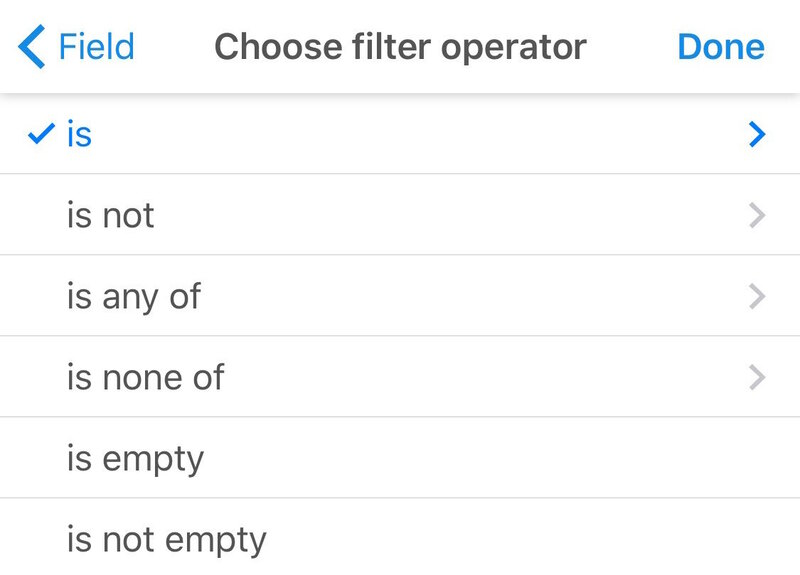 (You can also manually select the filter operator by tapping the filter operator button.) For a single select-type field, the available options are "is," "is not," "is empty," and "is not empty." We'll keep it as "is" for now. The last step is to set the comparison value. Here, we'll want to tap "Decision needed." When you're done setting the filter criteria, tap the Done button to exit. The Create Menu has now been updated to reflect the newly added filter. You can keep adding as many filters as you like to a view. For now, let's just stick with one. Tap Done in the upper right-hand corner to finish making our new view. Now, the only records on display in our table are the records for the candidates that are in the decision needed stage of the interview process. The view bar displays the name of the new view we just made ("Needs decision") and the blue funnel icon shows us that we have 1 filter applied. 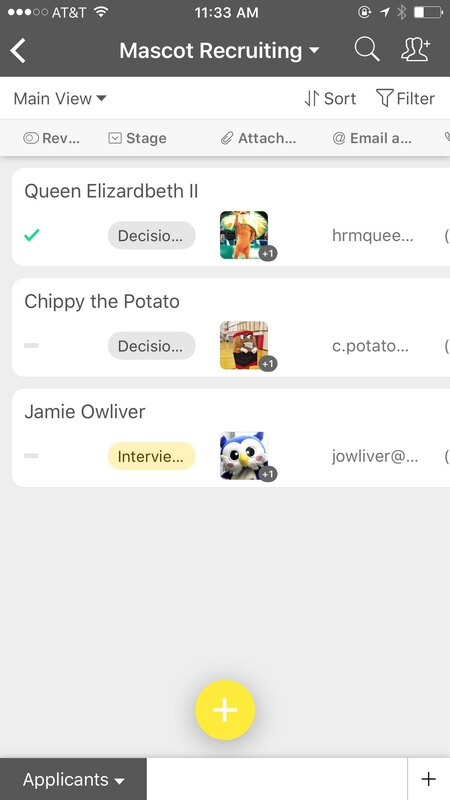 While filtering allows you to strategically limit the records on-screen, sorting will rearrange the records. Let's return to the main view—tap on the dropdown arrow in the view bar, then tap the main view row. From here, let's arrange all of our applicants in alphabetical order. Tap on the sort button in the view bar. This will bring up the "Sort records" menu. Click on "Create a new sort" to choose which field and order you would like your records sorted in. In this case, we want to sort the records in alphabetical order, so we will choose the Name field in ascending order (A-Z). 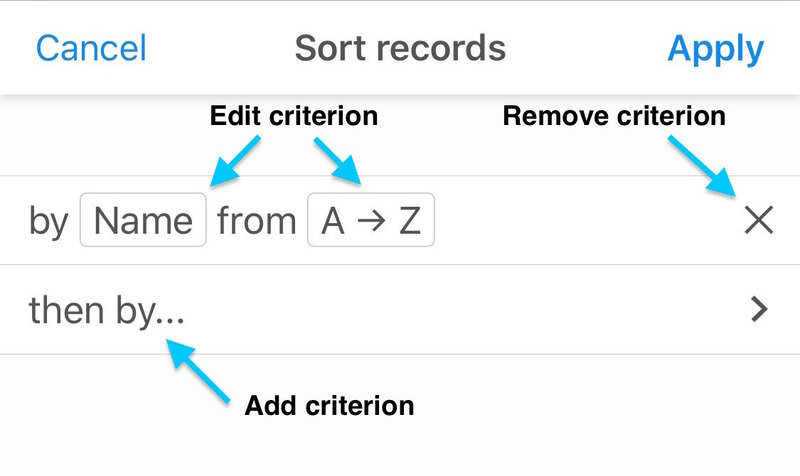 To apply this sort criterion, tap the "Apply" button in the right-hand corner of the Sort records menu. 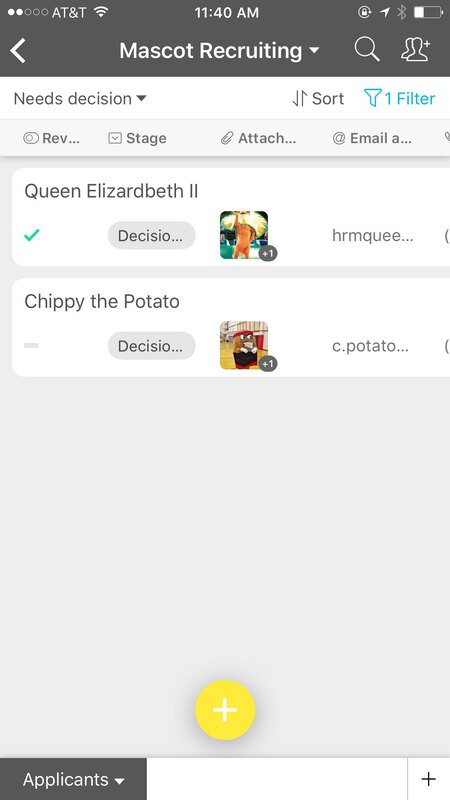 To adjust the sort criteria further, return to the Sort records bar, then tap the row of the criterion you wish to change. This will bring up a sub-menu in which you can change the field by which you're sorting, and the sort order. Tapping the "then by..." row will add a new criterion. Pressing the "X" on the far right of a criterion will remove that criterion. Alternatively, if you'd like to rearrange your records manually, you can always tap and drag records within a table to reorder them. Now, you've learned how to populate a table with records, and how to sort and filter those records. Next, we'll learn how to make new tables and link between them in Let's make a base, Part 3: Linking tables.